Rajasthan exudes charm through its opulent palaces, historical forts and tales of gallantry. Experience the culture, the people and geographical diversity of Rajasthan, which includes camel safari in the desert and camping in desert tents with modern facilities. Tour also includes journey by Indian Railways for a very unique India vacation experience. Stops include Delhi, Bikaner, Nawalgarh, and Manvar desert, Jaisalmer, Jodhpur, Jaipur, Ranthanbore Wildlife Sanctuary, Agra, Varanasi and Delhi. Welcome aboard your flight to Delhi, enjoy the regal hospitality by silk sari clad hostesses. Indulge yourself with delicious Indian and Continental cuisine. This evening arrive in Delhi, capital of India, your first stop of your travel to India. You'll be received and escorted to Hotel Park/ Hotel The Grand. Morning at leisure. Afternoon tour includes, the Presidential-Palace, Parliament House, India Gate, Qu tab Miner Tower, Jan tar Mantra, the fashionable Connaught Circus. Red Fort, Chania Chow, Mahalaxmi Temple and Mahatma Gandhi Samadhi. Evening free. After breakfast, drive to Nawalgarh in Shekhawati region of Rajasthan. Better known as the "realm of frescos," Nawalgarh was founded in the beginning of 18th century by Thakur Nawal Singh, a warrior-statesman. The city boasts of some of the finest frescoes in Shekhawati region. This typical Rajasthani town reflects the old world charm through its colorful bazaars and hand- painted havelis. 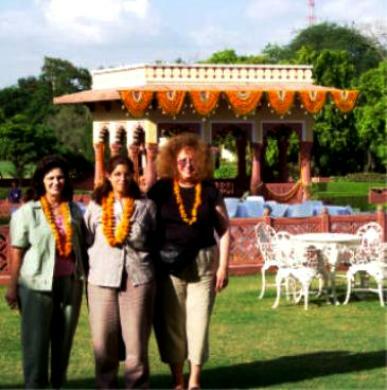 Hotel Roop Niwas Palace. Spend the day exploring the magnificent temples, havelis, forts and the villages by Indian bicycles, that makes this colorful city a very memorable part of the tour. After a hearty breakfast we drive to the Manvar Desert Camp, an experience that reflects the desert life at finest. The desert camp is in the midst of the wilderness surrounded by sand dunes. The camp is exclusive, consisting of 20 deluxe tents tastefully decorated with attached bathrooms providing running hot and cold water. Meals are provided in the strategically located dining tent, which offers breathtaking views of the sunrise, sunset and the surrounding countryside. Evenings are livened up by campfire, mashaals and local musicians and dancers. Full day activity of exploring the desert villages and sand dunes, each involving numerous visually stimulating sights and sounds to add to the excitement to your outdoor adventure and a taste of the Thar Desert. You can choose between camel and Jeep safaris. Visitors can visit tribal (bishnoi) villages, see desert wild life, watch local craftsmen at work and enjoy the beautiful sand dunes. The dunes around Manvar are untouched. After breakfast, we leave the desert camp for Jaisalmer, the western most citadel of the desert. 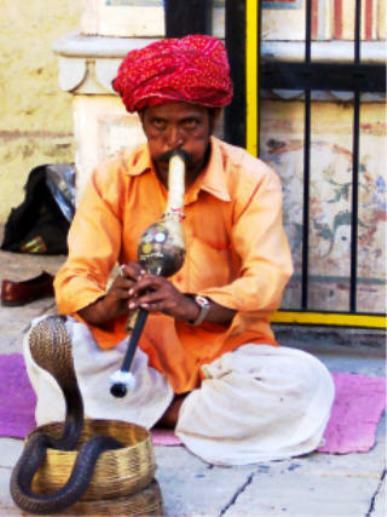 Jaisalmer has an ancient history linked with its development as a trading center. Part of its Golden Fort continue to be inhabited. We arrive here this afternoon and check into Hotel Fort Raj Wada/Gorbandh Palace. Day at rest. Sightseeing tour of this 12 century city dominated by its sandstone fort of 99 Bastions. Visit the exquisitely carved havelis and palaces with their latticed windows, balconies, cupolas and facades. Evening visit the sand dunes and take a camel ride. .
Full day sightseeing of Jodhpur city and desert. This morning we continue our drive to Jaipur. 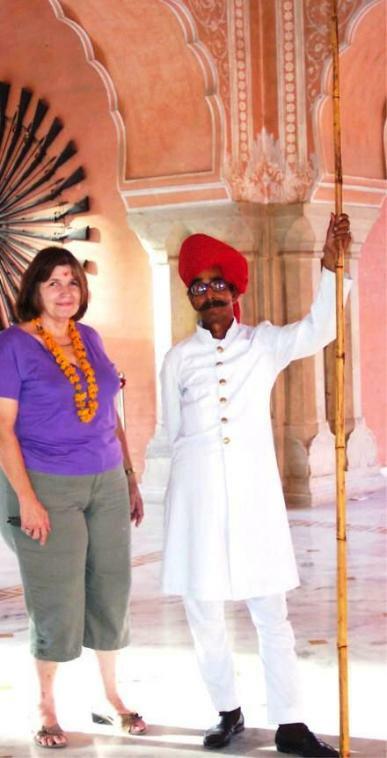 Arrive Jaipur, transfer to Hotel Mansingh Palace/Hotel Clark's. Day at leisure. After breakfast, travel in the style of Emperor Akbar to the Amber Fort atop festive Indian Elephants. Afternoon sightseeing includes The City Palace, Albert Museum, Jantar Mantar and the Observatory. For this evening, we recommend a rickshaw drive around the city displaying local life-style in the ancient biblical way. This morning we leave for Ranthanbore wildlife sanctuary. The imposing ramparts of the 10th. Century fort are surrounded by this Project Tiger Reserve. Check into Tiger Moon/Safari Lodge. Ranthnabore is India's one of the finest tiger reserves. Its topography of low hills and large lakes provides a tranquil idyll. Enjoy the world-class safari. All day game viewing and bird watching tours. Enroute to Agra well stop at Fatehpur-Sikri, the deserted sandstone city built by Akbar. This imperial complex of forts, palaces, mosques and temples was short lived and today is a haunting testament to that era. Check into hotel Hotel Taj View/ Clark's hotel. Afternoon at leisure to relax or take swim in the pool. This morning visit the world famous Taj Mahal in the early sunrise. Enjoy the architectural wonder and awe inspiring monument of love. Following the Taj Mahal visit, we'll head to Agra Red Fort, where Emperor Shah Jahan, Spent his last days gazing at his monument. This afternoon transfer to the train station for our overnight journey to holy city of Varanasi. Accommodation aboard the train in sleeper car. This morning arrive in Varanasi and transfer to Hotel Taj Ganges/Hotel Clark's. Morning free. This afternoon we'll visit Sarnath where Lord Buddha revealed his enlightenment to Nirvana. Hotel Taj Ganges/Clark's. Our day begins with a boat ride on the Ganges River, whose holy waters draw thousands of pilgrims. This remarkable tour shows the cleansing baths and burning cremation ghats of Hindu Funeral Rituals, followed by an in-depth tour of Hindu Temples. This afternoon fly to Delhi. Arrive in Delhi, the majestic capital city of India. Delhi blends within its folds a great cultural variety of India: an unceasing range of activity. Time free to explore on your own, great for shopping and browsing. Hotel Grand Intercon/Taj Palace. Depart early morning from Delhi for homeward bound. *Services of our tour managers.